(17/P92) TRENTON –Outdoor enthusiasts, crafting devotees, and fans of all things arboreal will gather again on Saturday October 7 at the Department of Environmental Protection’s Forest Resource Education Center in Jackson Township, Ocean County for the 23rd Annual Fall Forestry Festival. The festival will be held from 10 a.m. to 3 p.m., rain or shine. Admission and parking are free. Visitors will get the chance to meet beloved outdoor mascots Smokey Bear and Woodsy Owl, take a hayride, visit the New Jersey Tree Nursery, or join one of the many guided hikes scheduled throughout the day. Professionals in the natural resource field will also be on hand to give tips on water and soil conservation, composting, invasive insects and diseases, maple sugaring, managing your backyard forest, and more. Children, teens, and parents alike can plant acorns, build a wooden craft, make music in “Sounds of the Forest,” and even put on a harness and climb the old white oak tree. Plans are in place for demonstrations of the center’s sawmill and the utilization of logs from storm and/or insect damaged trees from around the state to be milled into useable lumber. In 1994, the Department of Environmental Protection’s Forest Resource Education Center in Jackson hosted the first Fall Forestry Festival, drawing attention to the work the center does in educating the public about forest stewardship — managing New Jersey's forest resources so that we have healthy trees and forests, clean air and water, and places to learn about and enjoy the outdoors. Food and beverage will be available for purchase at the Festival. Sturdy hiking shoes and insect repellant are encouraged. Parking is available for the festival at 370 E. Veterans Highway, Jackson. For driving directions to the Forestry Festival, call the Forest Resource Education Center (FREC) at 732-928-2360 or visit www.forestrycenter.nj.gov . 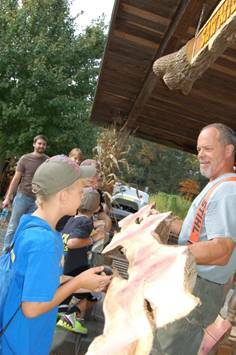 The Forest Resource Education Center (FREC), operated by the DEP's NJ Forest Service, is committed to providing exceptional conservation education programs that promote benefits of trees and forest stewardship to all age groups at no cost. It is the sole public facility in NJ focused on forestry education. Located on 875 acres, the FREC also offers miles of trails for hiking, biking, and nature watching.